It was a nasty, cold and rainy day here all day long today. I worked on a number of different projects around the house and ended up running out of time to grocery shop this afternoon like I had planned. Hubby stopped and picked up a quick rotisserie chicken on his way home from work and I rattled around in the refrigerator to see what I could make to go with it while he was on his way home. I had a bag of small brussels sprouts (about 2 pounds) that I decided to make. I didn't want to roast them...I was in the mood for something a little different. I trimmed and halved the sprouts and placed them in a covered glass casserole dish along with a few tablespoons of water and steamed them in the microwave for about 5-6 minutes (I used only a little water because I wanted them lightly steamed...NOT boiled). I drained them and placed them in a large ceramic skillet with some olive oil and melted butter (a couple tablespoons total) and began sauteing the sprouts over medium heat. While the sprouts were sauteing, I diced about 18 slices of pepperoni and 3 slices of provolone cheese. 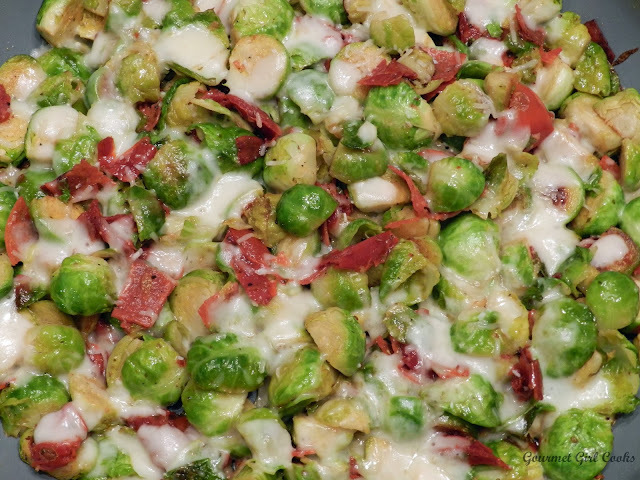 I added the diced pepperoni to the sauteing sprouts and cooked everything until the sprouts were lightly browned and still tender-crisp. I added a couple of heaping tablespoons of organic oven roasted roma tomatoes packed in oil (you could substitute a bit of sun-dried tomatoes packed in oil instead) and tossed them around until heated through, then seasoned with salt and pepper. 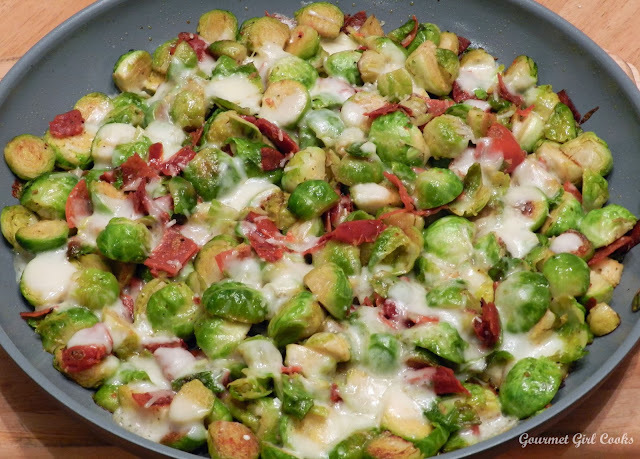 I scattered the diced provolone on top of the sprouts along with a couple tablespoons of shredded Parmigiano Reggiano; covered the pan and turned off the heat to allow the cheese to melt on top. I drizzled the sprouts with about a tablespoon of olive oil that is infused with garlic and red pepper (it's very spicy) and then served them along with sliced chicken breast and my Cranberry Orange Coconut Sauce. When I made the cranberry sauce last night, I added chopped walnuts to it for additional crunch. 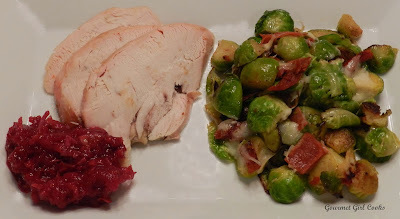 I enjoy eating a dollop of cranberry sauce with plain poultry and think cranberries are highly underrated and should be enjoyed more frequently than just on the Thanksgiving table. It was a simple and different meal because of the variation of the sprouts. I like trying different combinations and ways to use brussels sprouts since they are one of my favorite vegetables. I like them prepared almost any way except boiled. These were delicious with the spiciness of pepperoni, saltiness of the cheeses and the deep roasted flavor from the oven roasted tomatoes and the little kick of spice from drizzling them with spice infused olive oil on top. It was so simple yet so good and had a pizza-like flavor. I snapped a few photos below. Enjoy!